8 HOME IMPROVEMENTS TO MAKE THIS SPRING! Have you ever wondered when to replace your home’s windows? Obviously, when you need to do so—like when a window has broken or the frames are rotting, fading, warping, or cracking—it’s a no-brainer. But, what about when? You know, what time of year is the best time? It can be tricky deciding when to start a project. And, if your need isn’t immediate, there is an ideal time to replace! Let’s discuss! No chilly drafts will blow through your home while the installation crew is working. When it’s cold, your heating unit will have to work harder to maintain a comfortable temperature. Caulk sticks better in the warmer weather than it will in the freezing cold. Note: some caulk will not cure properly in hot temperatures. Work can be done more quickly and easily when temperatures are comfortable. The installation crew doesn’t have to compete with snow, sleet, and ice—all of which could delay the process. It’s important to know warmer months are the busy season for window installations; everyone is looking to have repairs and replacements done. Waiting too far into the summer could mean you’re competing with other homeowners for available dates. Schedule your contractor to on a sunny day (if you can). Choose a mid-morning time so materials have a chance to warm up as the day progresses. Be wary of rainy weather. Most reputable contractors will not perform a window replacement on wet exterior surfaces. Ask your contractor to use silicone-based caulk around the windows (rather than latex or acrylic). Silicone more readily adheres to surfaces in colder temps. Have the installers work on one window at a time (to keep your home from quickly feeling like a refrigerator). Have the window openings covered with floor-to-ceiling plastic to keep the drafts out! Here’s the thing: there may not be a perfect time of year to have your windows replaced—but hopefully this article helps guide you toward a successful home project in any season! 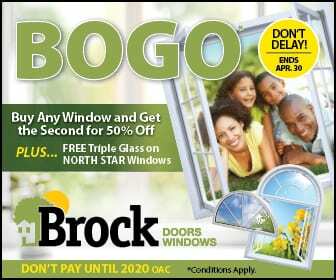 Give our experts at Brock Doors and Windows a call to schedule your free in-home estimate!